Rats are often misunderstood and unappreciated creatures, but rat owners know better for they have firsthand experience of the bliss a tiny rat can offer. Contrary to popular belief, rats are smart, playful, and social creatures that make awesome pets! Rats can bring heaps of joy and laughter with their little presence. That is why rat owners only want the best for their pet rats’ health, comfort, and overall well-being, and that includes his food! Keep in mind that your pet’s diet can significantly affect his health, growth, and happiness. Now, the easiest way to cater your pet’s daily needs is providing him with dry rat food. When you feed your rat a new kind of food, he will take a nibble and then disregard it. Don’t take the food away and assume that he is done. Your pet is simply testing the new food to see if it makes him sick or not. If it won’t, your pet will go back and eat the remaining food. Rats will begin to refrain from testing their food as soon as they get used to it or when they fully trust their owners. Hence, it is imperative as a rat owner to feed your rat only good food. Knowing what your pet can and cannot have is crucial. So consider the following factors before you make a purchase. Rats enjoy eating any food that they can get their tiny mouths on. You can give your whiskered friend soggy bread and morsels of rice and they should be all right. After all, rats can even survive in sewers. FALSE. Pet rats demand the same vitamins and minerals that your other furry pets need to stay healthy. Choosing a low-cost rat food from unreputable brands is similar to feeding your pet with scraps or junk food. Rat foods aren't made equal. Cheaper brands also use cheap ingredients and fillers to bulk out the food. Providing your pet rat with such may fill his hungry stomach for a while, but he will be deficient in the major nutrients that his body needs. Bear in mind that malnutrition makes your pet more susceptible to diseases. Hence, opt for a reputable brand to ensure that you get only high-quality dry rat food. It is always worth investing in premium brands since they have reputations to maintain. Rats have taste buds just like us. They can taste the food if it is salty, sweet, sour, or bitter. That is why rats also love to take a nibble on your cake. It would be difficult to persuade your pet rat to eat his food if it isn’t appetizing enough for him. Since you can’t taste rat food or guess if they would like it, doing a little research first would be best. Likewise, pay heed to helpful reviews. Buy in small quantities also and do a trial before buying in bulk. Apart from the flavor, palatability for rats also includes the smell of food. Aroma is a vital food characteristic for rats since they have superior a sense of smell. Opt for pellet or block type in rat food. Pellets or blocks look plain and identical to prevent selective feeding. If you have a fussy rat that tends to reject the mixed or homemade food you just made, uniformed pellets are your best options. Moreover, rats find crunchy blocks very enticing. Crunchy food helps rat trim their teeth while they counter boredom. Always be vigilant and check the label. If your rat has to eat the same food every day, then make sure it exhibits all the nutrients he needs. Most importantly, it should not be high in sugar and simple carbohydrates. Likewise, opt for rat food with natural preservatives. Rats require different levels of nutrition as they age. Adult rats, for instance, require a low-fat diet to prevent obesity while young rats require more calories. Rats are just as complicated as we are, humans. Rats are omnivores; thereby, eating a wide range of food from vegetables to desserts. They enjoy healthy snacks and junk food just as much. Thus, lab-grade dry food is highly recommended as your pet rat’s main meal to make sure he gets all the vitamins and minerals he needs. Below are five of the best dry rat foods based on sales, ratings, and reviews to help you choose what’s best for your fancy pet. 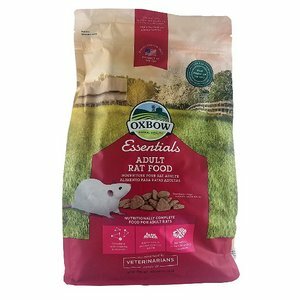 Nourish your adult pet rat with one of the leading brands in the market, the Oxbow Regal rat food. Rats, age four months and beyond, have different dietary needs compared when they were growing kittens. Adult rats are less active and don’t demand the exact levels of nutrients and fat. Consumption of food high in fat can only result to obesity and other health problems in adult rats. Oxbow Regal rat food provides your pet the nutrition he needs based on his age. In fact, it is among the healthiest options on the market. It contains a low-calorie energy source from oats and brown rice; fiber from wheat; as well as healthy fat and protein sources from soy and fish. Furthermore, the product is specially formulated by wildlife nutritionists and lab scientists to encourage longevity and well-being of your pet rat. Likewise, the Oxbow Regal rat food restrains selective behavior in pet rats with its uniformed blocks. Selective feeding is a common problem linked with seed-based diets. Apart from having no seeds, the Oxbow Regal rat food contains no artificial flavors and preservatives. The Oxbow Garden Select rat food is specially formulated to provide complete and balanced nutrition for your pet rat. It features delectable garden fresh flavors of carrots, spinaches, bananas, tomatoes, and yellow peas. It is guaranteed non-GMO and offers a natural foraging atmosphere for your beloved pet. 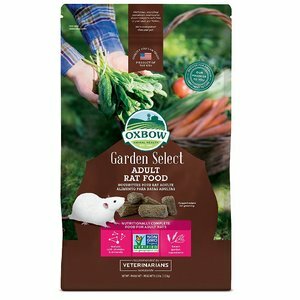 In addition, the Oxbow Garden Select rat food comes in identical pellets with rugged edges to encourage gnawing to keep your rat’s teeth squeaky clean. The vegetable-based selection is also suitable for growing rats, pregnant and nursing mothers. Young, active rats need higher levels of certain nutrients to promote their early development. 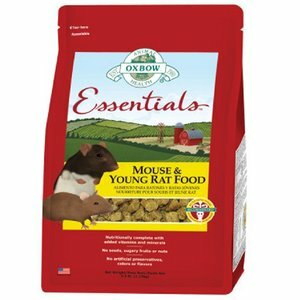 Oxbow Essentials is rich in protein, healthy fats, and complex carbohydrates that help young rats grow strong and lively. In addition, it is fortified with calcium, vitamin C, vitamin D, and vitamin E, all of which strengthen baby rats’ immune responses to diseases. Oxbow Essentials comes in easily digested and uniform pellets to prevent selective feeding in kittens. Also, the product contains dietary fiber to promote healthy digestion. Pregnant and lactating mothers can also benefit on Oxbow Essential’s enhanced formula. It provides the much-needed nutrition for pregnant rats for the growing needs of their babies. Keep your pet rats hale and hearty with Kaytee Forti-Diet Pro Health rat food. Kaytee Forti-Diet Pro Health aims to provide wholesome ingredients for your pet’s optimum health while he enjoys munching on crunchy nuggets that also tickles his palate. A challenging chew can also help trim and clean your rat’s teeth, all of which is essential for small growing pets. 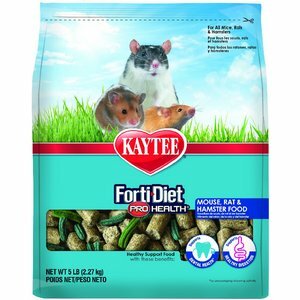 Moreover, Kaytee Forti-Diet Pro Health is rich in natural antioxidants and probiotics that promote healthy digestion for your pet rats. Likewise, it is fortified with DHA and Omega-3 fatty acids that help prevent joint problems, as well as promote eye, heart, and brain health. Kaytee Forti-Diet Pro Health has no artificial flavors or colors. 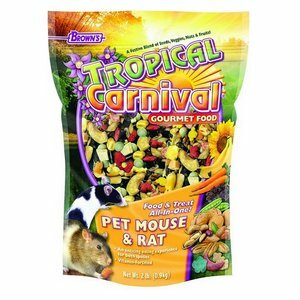 Brown’s Tropical Carnival Mouse & Rat food provides your pet a tempting and pleasurable meal with its assortment of seeds, vegetables, nuts, and fruits. Even finicky eaters will enjoy its premium mix. Brown’s Tropical Carnival Mouse & Rat food is designed to suit the needs of rats in all life stages, especially for kittens, pregnant and nursing rats. Moreover, it promotes heart health through the inclusion of omega-3 fatty acids as well as strengthens immune system with its abundance of antioxidants. Overall, it is an all-in-one meal and snack that provides health benefits for your whiskered buddy. Brown’s Tropical current rat food is definitely a great choice for value and quality. Feeding your fancy rats is not much of a challenge compared to other pets, but there are some points to consider when doing so. Rats are omnivores similar to humans and love a variety of food that includes vegetables, whole grains, and protein sources such as dog food. Chances are, your rats would steal some of your pizza and chips if he has the chance. While your whiskered housemates may love to munch on tidbits, don’t allow them to become obese, or they may suffer a number of health issues. Moreover, fruits, seeds, nuts, and vegetables are appetizing to rats, but these small pleasures can cause skin problems so should be an occasional treat. Most importantly, a regular diet of fruits and vegetables can upset your rat’s stomach. For a majority of rat owners, a high-quality dry rat food along with a few fresh snacks is the best and most convenient way to provide your hungry rat the nutrition he requires. Loose seed mixes can be nutritionally balanced, but picky eaters tend to neglect most of it. Pellet or block diets, on the other hand, are ideal since it prevents selective feeing as the rat won’t be able to choose which bits they do and do not want.